Adjustable inline skates can stretch to accommodate growing feet. 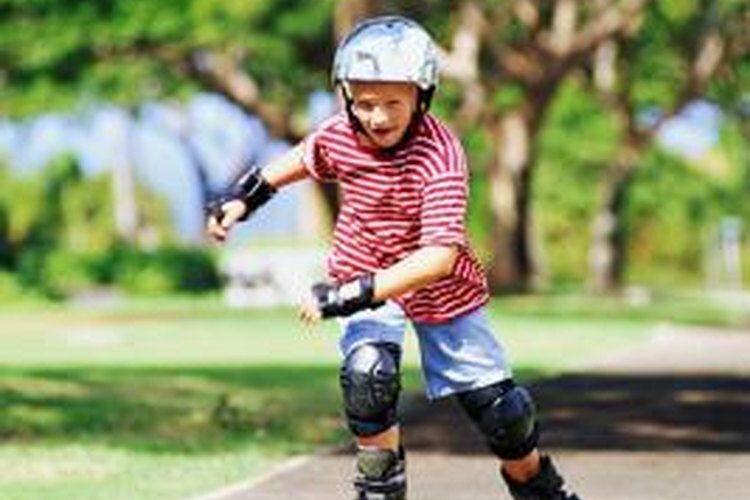 A growing child can grow straight into, then out of, a pair of inline skates in one summer. Instead of buying skates that are a little too big -- which can affect the skates' handling and your child's safety -- obtain adjustable inline skates. Usually, adjusting the skate boots to fit your child's feet is as simple as pushing a button, then sliding the front of the boot forward. Most recreational children's skates adjust with a simple push-button mechanism, which you should only use when the skates are off your child's feet. Press in on the adjustment button or tab that's located near the sole of each skate boot, then pull the front of the boot out to the desired size. Make sure the button clicks back out again; this signals that you have the boot properly locked into place. The process for adjusting high-end children's speed skates -- which your child should only use if he's already a very experienced skater -- requires a few more steps. For example, on the Luigino Kids Mini Challenge adjustable speed skates, you must first use the tool that came with the skates to remove the wheels and the frame, then unlace and unstrap the boot. Once that's done, you can pull forward on the toe of the boot to adjust it.